At Benner's Gardens, our fence posts are made from heavy-duty black-coated steel to give your fence the support it needs. 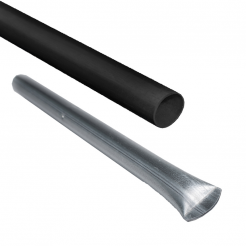 The post sleeve makes each post easy to install. Simply drive the sleeve into the ground using a sledgehammer and a driving cap, then slide the post into the sleeve. After that, you can attach your fence and enjoy both deer and animal protection for your property. This is our premium post system. Use these posts to install a 7’ high fence! The actual post is 8' in length. Use our Driving Cap (one lasts for approximately 20-25 posts) to drive the sleeve into the ground with a sledgehammer and then just slide the post right in! 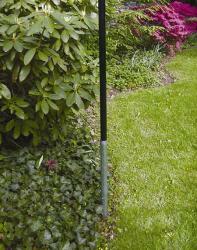 It is recommended that our Heavy Duty Posts be spaced about 15' apart. Note: A Driving Cap is required for these posts.